Paleontologists recently unearthed another prehistoric crustacean – a predator with four eyes that lived in the Cambrian age and had a variety of claws with limbs, suggesting that the earliest arthropods may have experimented with the possibilities their limbs had. 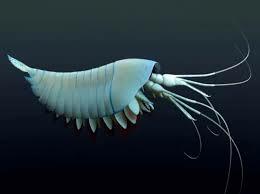 The creatures has been identified as Yawunik kootenayi, and it lived about 508 million years ago, towards the end of the Cambrian Period in what geologists have termed the Paleozoic Era. While people generally think of dinosaurs when they think of prehistoric times, Yawunik was around well before them – less time elapsed between the date of your birth and when T-Rex died out, than there is between Yawunik and T-Rex. Arguably, the animals Yawunik shared the Earth with were more intriguing than the dinosaurs too. It lived in an era when the major classes of animals – fish, insects, amphibians, first began to roam the Earth and the first sophisticated ecosystems began to take hold – an epic period of evolution known as the Cambrian Explosion, largely made possible by the oceans becoming fully oxygenated for the first time as levels of oxygen-absorbing marine bacteria began dying off. Yawunik was part of a diverse group of shrimp, who shared the ocean with trilobites, spiny sea caterpillars appropriately named hallucigenia, and giant, predatory squid. The fossils bear a slight resemblance to modern crabs, one of its distant relatives, and have been compared to the size and shape of an empanada meat pie (6 inches, or 15 centimeters, long). The discovery is just a matter of scratching the surface – it’s only the first of several discoveries made within a newly uncovered fossil bed in British Columbia’s Marble Canyon at Kootenay National Park. The Marble Canyon fossil beds were first discovered in 2012, and already may rival British Columbia’s world famous Burgess Shale for its wealth of soft-bodied fossils, preserved in a pristine state, according to scientists. So far, they’ve found a myriad of Yawunik specimens among the shale, a flaky rock layer that results from layers of compressed mud. Since it was a predator, based on its size, it likely played an important part at the top of the food chain, according to the study’s lead study author Cédric Aria, who is a graduate student of paleontology at the University of Toronto in Canada. Its role may have been akin to the function served by sharks, who are the apex predators of ocean reefs throughout the world. They named the arthropod Yawunik kootenayi both after the site and for the indigenous Ktunaxa people who long resided in the Kootenay area in which the Marble Canyon excavation site had been found. Yawu’nik in their language meant literally “where the rock stands,” referring to a covenant made between the people and the land in their creation myth. The new species was first described on Friday in the journal Palaeontology. Like modern shrimp, the Yawunik is of the group of animals known as leanchoiliid arthropods – a diverse phylum of animals that thrives to this day, making them among the most successful organisms on Earth with the wide variety of climates they have successfully adapted to. Today, they comprise roughly 80 percent of the known species on Earth. Closely related to insects, the phylum consists of shrimp, spiders, scorpions, and the closest modern relative of the trilobite – the horseshoe crab. In light of these new discoveries, scientists now have yet to completely agree on how and when the basic segmented body and exoskeleton of the arthropod began to evolve – the components most often found in fossils. The reason is that like today’s arthropods, their Cambrian ancestors also had many legs, each set specialized for doing just one particular of any number of activities: whether it’s for eating, swimming, breathing, sensing or even attaching to a mate for reproducing. A big difference between Yawunik and its modern cousins, however, is its front limbs. They might appear frail, but they were in fact a double threat – long claws which it used to both hunt and to grab onto its prey. Both frontal limbs consisted of three long claws, two of them had long rows of teeth for trapping and holding onto food, similar to a lobster’s claws. Perhaps the strangest feature were sets of whiplike flagella jutting out of the tips of the claws. Aria suspects that the flagella acted like the front legs of a tarantula, allowing the Yawunik to seek out any passing fish or other organisms nearby, determining first how well they might taste. While Yawunik swam, it swept back and forth against the current with its limbs, which it could retract under its body and spread out when attacking prey. the Yawunik is perhaps most closely related to the modern group chelicerates, which is comprised by spiders, horseshoe crabs and scorpions. This is because the claws are actually rather similar to those of living spiders. However, Aria suspects that this prehistoric beast is more likely part of a stem group, one that broke off of the direct ancestors of modern arthropods. Since it was discovered back in 1909, over 200,000 fossils so far have been extracted from the Burgess Shale. The Marble Canyon quarry, just 25 miles down the road, could potentially be hiding even more prehistoric creatures and evolutionary links. The sites also date back to the same periods, separated only by 100,000 years – which to geologists is practically the blink of an eye when it comes to rock layers. However, the species found in both spots are vastly different, with the animals found at Marble Canyon more closely representative of creatures excavated at older sites discovered in China and Australia, than they resemble the finds in the Burgess Shale. “This material is not only so well-preserved but it is so old that we are really tackling immense questions about the origins of modern ecosystems and modern animal groups,” Aria said. The Royal Ontario Museum has plans to feature the Marble Canyon discoveries in a display currently under construction. Further analysis shows that the fossils actually contain a combination of preserved organic compounds, such as pieces of crustacean shell as well as calcified mineral deposits, which replaced its filaments after it died.